This article is 3061 days old. windsoriteDOTca wanted to get to know just who Scott Funnel was, so we asked some bands that were playing at Funnelfest 2.0 to tell us about Scott and what he has done for them and the local music scene. We showed you some of their responses on Tuesday. Here are some more! After learning about the idea of a fundraiser and music festival we wanted to be apart of it any way we could. Then seeing the overwelming support of bands and volunteers, it just shows what a great, well deverse music scene we have here in the city. We actually played our first Windsor show at the Coach and Horses a few years ago. So in a way Scott introduced us to the Windsor scene of music, and no matter what skill level or genre of music, you were always made to feel very comfortable at the Coach. So we are very honoured to be opening up the show Friday night for a great guy and great cause. One of the reasons The Heatseeking Moisture Missiles is supporting FunnelFest 2.0 is because we’d like to return the favour to Scott for supporting us. THSMM played its first Canadian show at The Coach and have played there on several more occasions since. Every time we’ve played The Coach, Scott has sat in on lead vocals for one of the songs in our set. The place always goes nuts when Scott sings. But more than just supporting us directly, Scott and The Coach have supported punk, hard rock, and metal music for years. The Coach provides a venue for local and out-of-town bands to play and local fans to come out and listen. Scott has been the heart of The Coach and its support of the metal/punk scene. Very few other establishments in the Greater Windsor area will book bands of this musical style. Everyone knows that The Coach is the premier venue for hard rock/punk music in the city and this reputation is due to Scott’s Herculean love and support for the genre. So when we heard that Scott had been savagely attacked, we immediately asked what we could do to help him out. 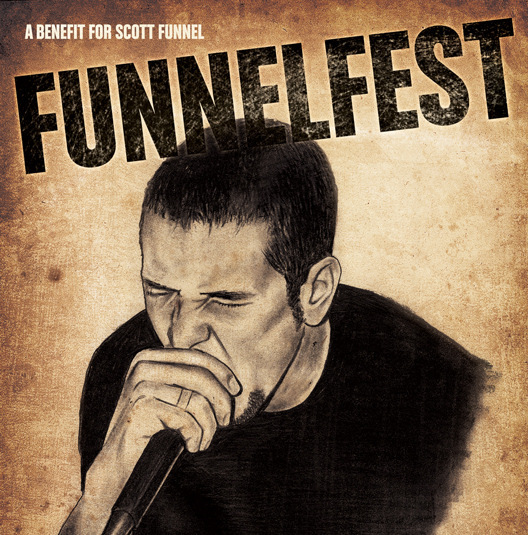 THSMM is proud to be one of the bands supporting Scott at FunnelFest 2.0.